With just weeks to go until the launch of new ships Pacific Aria and Pacific Eden, P&O Australia have taken a trip down memory lane to celebrate the 5th anniversary of its first celebrity chef restaurant at sea, Salt Grill, releasing a new YouTube video series which aims to capture the “food revolution” currently taking place aboard the P&O Australia fleet. The short video – which was released earlier today on the cruise line’s dedicated YouTube channel – stars celebrity chef and restaurateur Luke Mangan, as well as P&O Australia’s Senior Vice President, Sture Myrmell. During the video, the duo chat about the origins of P&O’s first at-sea celebrity restaurant, with Mangan stating that taking his ‘Salt Grill’ restaurant to the sea was one of the best decisions he has ever made. The Salt Grill restaurant has become a much-loved dining favourite since its launch in 2010, serving a delicious array of locally sourced seafood among other contemporary dishes. 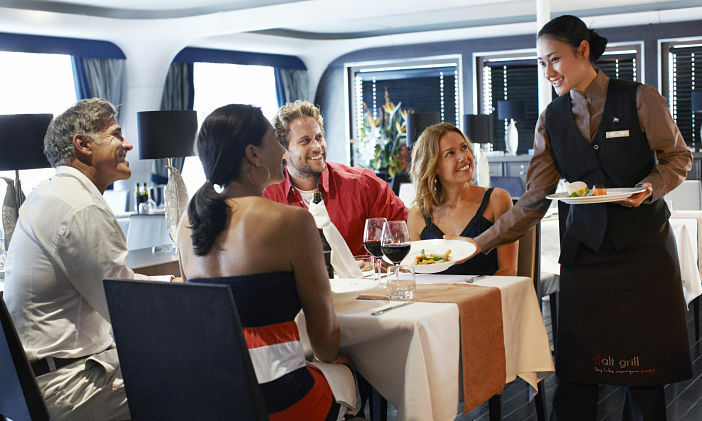 Mangan’s dining concept will be extended to P&O’s new ships, Pacific Aria and Pacific Eden, when they’re launched later this year – something Myrmell states will help keep P&O at the forefront of modern, at-sea dining in Australia. In the run up to the launch of Aria and Eden, P&O has said it will release a further four videos in celebration of its continuing culinary revolution. To keep up to date with the forthcoming videos, consider subscribing to P&O Australia’s YouTube channel.